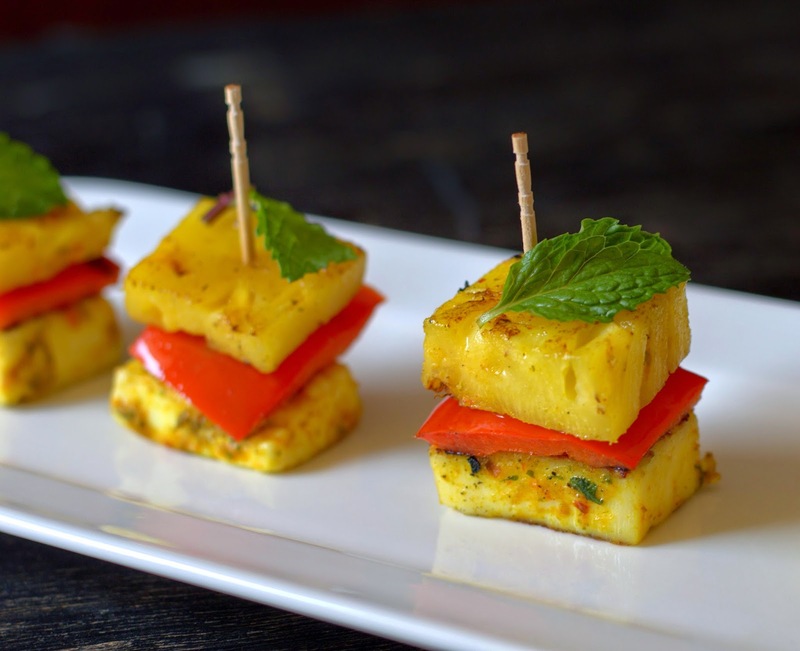 Cakes & More: Grilled Pineapple & Cottage Cheese Bites - Desi Health Bites! 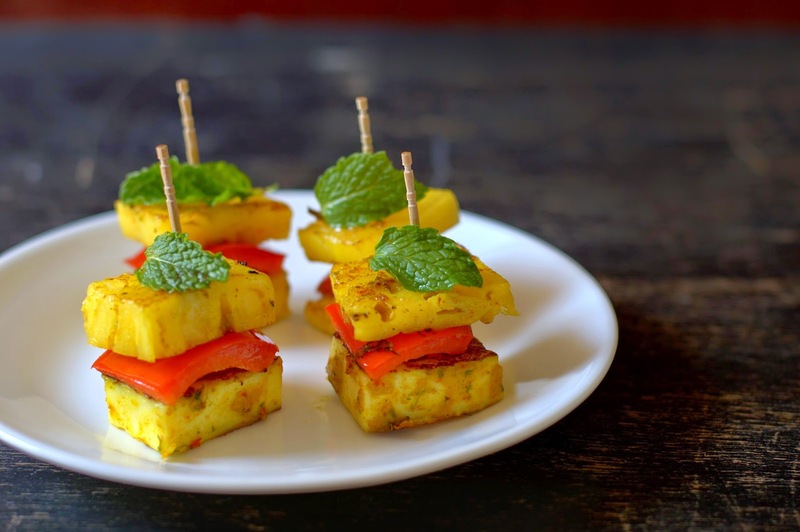 Grilled Pineapple & Cottage Cheese Bites - Desi Health Bites! In a country where most recipes begin with heating oil in a pan and end with a tempering of oil and spices, disseminating information about cooking oil is a welcome idea. Fortune Foods invited food bloggers to come up with healthy recipes as part of an initiative to highlight some facts and bust some myths about rice bran oil. The company launches a 100% rice bran oil, Fortune Rice Bran Health. This oil is extracted from the thin brown layer (or bran) of unpolished grains. The bran contains lots of vitamins and other micro nutrients, making it the most nutritious part of grains. increase good cholesterol and keeps your heart healthy, making it a healthier choice. illnesses, keeping your heart healthy. 3. Helps to have better skin: Squalene is an organic compound naturally produced by human skin cells and is a natural moisturizer. Fortune Rice Bran Health Oil contains good amounts of it which prevent the ageing of skin. intact. It has a darker appearance primarily due to Oryzanol. taste of its own, so it doesn’t interfere with the taste of food. Here comes a delightful tango of hot-sweet flavors, Grilled Pineapple & Cottage Cheese Bites. Light enough to be served as a summer appetizer, enough spices to tickle the Indian palate. On low heat, heat 1 teaspoon oil in a pan. Tip in the chilies, saute till lightly blistered. Now add the coriander and saute till just shriveled. Transfer to a plate, let cool. Grind the sauteed chilies, coriander, garlic, cumin powder, a tablespoon of oil and salt to a smooth paste. At this point, you can store the paste in an airtight jar for a day in the fridge. Whisk 3 tablespoons paste with the yogurt, besan, chat masala, kasuri methi, going easy with more salt as chat masala already has salt in it. Taste, adding more marinade if you want it to taste more assertive. 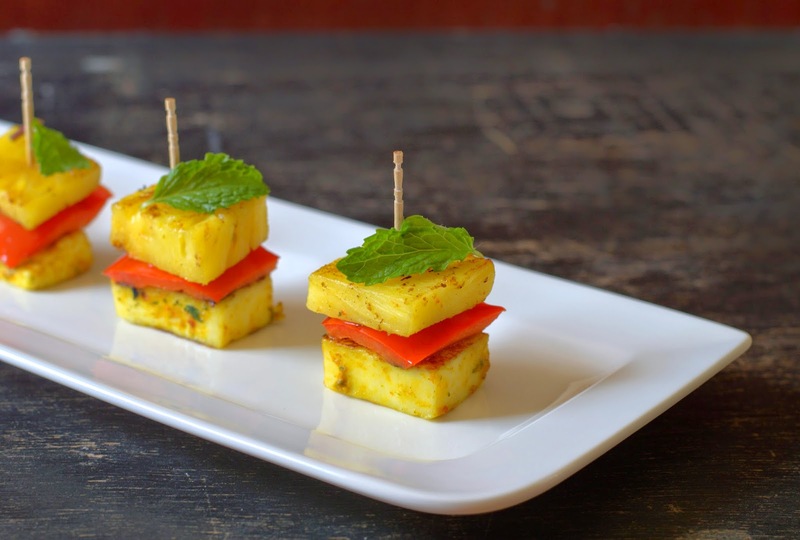 Take the paneer, pineapple and capsicum in a bowl, scrape the marinade on top . Mix gently, coating the pieces well. Marinate for at least half an hour or longer in the fridge if convenient. Thread so that pieces of paneer, capsicum and pineapple alternate on the skewers. Heat a non stick tawa. Brush generously with oil. On medium heat, grill till lightly charred, brushing oil lightly as needed. Take care not to overcook or the paneer will become tough and chewy. Serve immediately. Succulent pieces of sweet pineapple, soft cottage cheese and crunchy red peppers, I thought is a winning combination! You could even skip the cottage cheese to make it a really low calorie version! Please note: I have used home made cottage cheese made with 3% milk. You can use store bought paneer or even pressed and drained firm tofu. Any remaining ground paste can be simply whisked into fresh yogurt, add a simple tempering of mustard and curry leaves. Enjoy with hot steamed rice or parathas. Or even tossed with cubed chilled cucumber as a snack! the snack looks so good. love the pictures. Lastly let me know some people usually use only cooking option to cook cake (Use for 5 min) do u feel that it gives equally good taste like the convection one. What should i use while grilling chicken...Mico+ Grill or only Grill. Please let me know or mail me to prakash_stocks@yahoo.com..plzzz. i can stare at those cubes for hours, so drool worthy!! !